Inventory of Forklift Parts, FREE! 123Forklift has the largest selection of new and used forklift parts in North America. Save up to 50% on forklift parts by shopping online. We stock THOUSANDS of forklift parts for CAT, Crown, Linde, TCM, Nissan, Mitsubishi, Clark, Raymond, Toyota, Komatsu, Barrett and Doosan. 123Forklift has five distribution centers across North America which assures prompt delivery to your location. 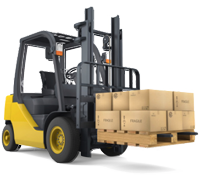 Our inventory includes forklift batteries, forklift tires, forklift motors, chargers, transmissions, cylinders, pumps, valves, steer axles, differentials, mast assemblies, carriages, hubs and axle shafts. We offer warranties on all parts and ship anywhere in the U.S, Canada and Mexico. 123Forklift has the highest quality forklift parts for the lowest prices GUARANTEED! For many businesses, forklifts are machines that are needed every day in the normal course of business. As your forklift ages, so do the forklift parts. 123Forklift makes it as simple as 1-2-3 to find any part you may need. Simply click on the product category you need and begin shopping. The main product categories are forklift batteries with chargers, forklift transmission, forklift engine, electric forklift motor and forklift tires. We will beat any competitors pricing and have the part(s) to you quickly so that there is minimal downtime. Established - Over 25 years experience in forklift parts, heavy equipment and material handling equipment. Over 10,000 new and remanufactured forklift parts in inventory. Great Prices and same day shipping on in-stock items.